brittle season usually starts around here in october. bill and i make batches and batches of cashew brittle every year. we probably make between 30 and 50 pounds a year. we make cashew brittle – no peanut brittle. 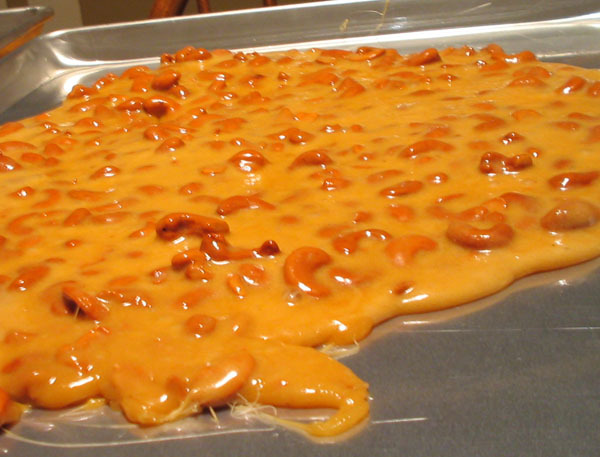 although i AM thinking about trying some almond brittle this year. we make plenty of other things; but brittle and chocolate-dipped “stuff” (oreos, pretzels, ritz crackers, potato chips) make up the bulk of our holiday treats. we package up pounds of the stuff every year for gifts. the recipe below made enough to fill the 2.5 pound plastic jar the cashews came in, two other 4-cup gift containers, and a larger 8-cup ziploc container. the cashew jar’s going to a coworker, vernie, down in my mobile office. i send that office goodies every year; the first year i sent it, vernie told me “that is the best thing i’ve ever put in my mouth.” heh. nuff said. i know many of you are terrified of making anything that requires the use of a food thermometer. all you need is the right tool. look specifically for a candy thermometer – one that rises to over 300 degrees fahrenheit. and clips on to the side of a pot. a high sided pot. and do NOT use a metal long-handled stirring spoon WITHOUT a composite handle. this stuff gets HOT. oh. and be very careful not to brush your husband’s hand with the spoon you’re scraping the molten liquid out of the pot with as he’s pouring onto the baking sheets. i’m just sayin’. that would be a BAD thing. we USUALLY double this recipe. then you get double the amounts listed above. i’ve never weighed the results. we’re guessing you get between 4 and 4 and a half pounds per batch. Combine, cover pot, bring mixture to a boil over high heat, about 5 minutes. remove lid, reduce heat to medium. Insert thermometer, boil to 230 degrees. cool one hour. Break it up. I can testify that this is great stuff!!! That looks like a person would KILL for it. I have to remember what the hell that is for my next round of Catch Phrase. Who does your washing up? Those are some clean corners on that jellyroll pan. Tmpressive. ohmydog that looks to die for. or to lose one's skin for at the very least. if you were going to make another nut brittle, you'd just change the nuts - you wouldn't have to change anything else about the recipe? Just stopping in to say hello and to congratulate you on your recent nomination at the BoB Weblog Awards 2004.